Veggie Tacos!! How to Make a Healthy Lunch in Less Then 15 Minutes!! Are you looking for a quick, easy and healthy lunch recipe??? Are you needing to add more veggies into your eating habits?? 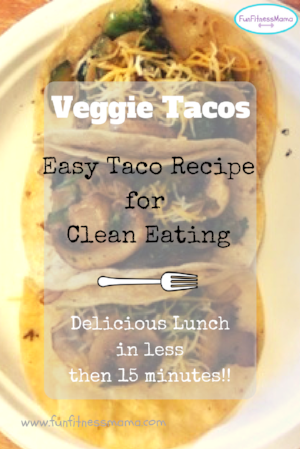 This Veggie Taco Recipe is perfect for you!! I made this the other day for lunch and it was delicious. I was sick of having salads or pbj sandwich for lunch, so I grabbed a bunch of veggies out of my fridge and made tacos!! It was filling, healthy and jammed packed with veggie goodness! Directions: Chop up all the veggies. Heat a skillet (medium heat) & drizzle a couple tsp of EVOO. Cook all the veggies, EXCEPT for the spinach...you'll cook that last. Sprinkle in the seasonings (to your liking) cook veggies until tender and brown. Once your veggies are cooked/browned, add in the spinach. Stir in the spinach and let it cook down for a few minutes. Next, heat up the tortilla shells. Add veggies to the shells and top with your favorite toppings. For this recipe I topped it with a little bit of Mexican shredded cheese! This recipe makes 2-3 shells! These tacos are great for those that want to change up their lunch, need more veggies in their diet or for those that don't like to eat meat! I hope you enjoy this recipe too! Comment below what veggies your used for your tacos!